OK...well..all of these were shot from a vantage point that sadly, no longer exists. Can you identify them? Not your normal NYC pictures, I grant you, but my eye always went to the lesser thought of angles - pictures of things people pass over. HEY IT IS HARD TO BE WORDLESS!!!!! Oh yeah Vinny, force me to listen again! And Debbie is beyond cool. My god I love The Ramones. I weep over CB's being a high end mens store. Almost makes me glad Joey, Johnny, Dee Dee and Hilly are not here to see it. That's okay Vinny...it's your blog...ramble on! I, however was able to go wordless...I paid tribute to rebuilding of an unspeakable act. Loved the tunes, except I couldn't get the third one to play. 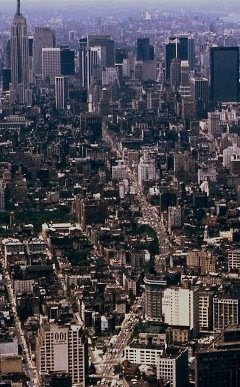 I always thought that the pictures I took from the Empire State building were cool...looking down on such a huge city. But it sure was hard to look across at that gap in the opposite skyline. I do not so wordless WW as I did this week. Cause I am a rebel like that, yo. Is the bottom one the Brooklyn Bridge? I am having a Saturday Night Fever lets be a dink on the bridge flashback. Would love to see your pictures someday. I'm sad these particular views don't exist anymore, but you have them embedded in your memories, so they're safe. I saw Blondie in concert once - great time. 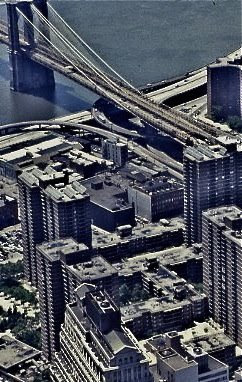 STARRLIGHT: What details...that is the Manhattan access to the Brooklyn bridge. On that side of the bridge, you empty right into China Town. SONGBIRD: Well, we know exactly where dear...LOL They are embedded in my memory and on film...i have many others from up there. Beautiful shots Vince. And great tunes. Mourning the loss of landmarks I shall never get to see....I knew I should have stayed in NYC longer than four days when I was there. it is..I was merely quoting Stevie Wonder. 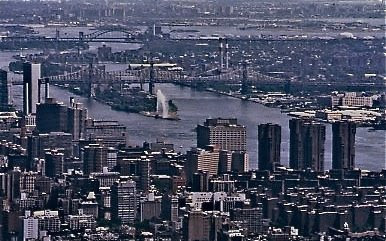 I grew up 15 miles west of the Lincoln Tunnel. Great photos! LEELEE: Sorry...I did get the Stevie reference...one of my fav songs by him actually. Bond - Don't tell me. It's New York City. no I don't recognise them but I do really like them. It's so different to anything here. Hmm I like number one pic and number two song. Beauties Vin! I love the angles, very cool! !